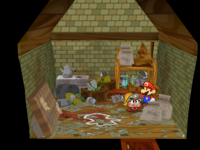 Larson – a pun on "larceny", an alternate term for "theft" – is a Bandit who defrauded Goomther with a fake credit card in Paper Mario: The Thousand-Year Door. After he performed this crime, he wished to continue criminal actions; however, after Goomther told the Trouble Center, Larson began hiding in the hidden alley of Rogueport alongside Darkly. Larson's dialogue is generally the same throughout the game, but after each chapter his ending phrase changes. If the player takes Goomther's trouble, Mario and his partners have to chase Larson around Rogueport. (He is first found in his normal spot, though he respectively runs to Rogueport's harbor and its back alleys as the trouble progresses.) After catching him for the third time, Goomther will appear to enact revenge upon him. Larson was seemingly never brought to official justice, as he resumed his position in Rogueport's hidden alley and even continued his crime-insinuating speeches. In the Japanese version of the game, Larson's house contains blood stains surrounding a chalk outline of a Toad. These were removed when the game was localized to avoid a higher age rating. Whoa! Mario, that's the guy! That's Larson, the thief that Goomther asked us to catch! So this is where he's been hiding! Let's nab him and get the reward! C'mon! That's Larson, the bandit. The word's out on his scam, so he's laying low here. Of course, he wouldn't have to lay low ANYWHERE if he'd just kept his nose clean. You think maybe he just gets a thrill from breaking the law or what? This page was last edited on March 10, 2018, at 06:53.